Home » A Complete Guide to Heat Pumps in 2019 » CO2 carbon savings of a heat pump and their environmental cost. CO2 carbon savings of a heat pump and their environmental cost. How much CO2 is produced in the manufacturing of a heat pump? As there is currently little research into the exact CO2 and energy consumption figures generated / used during a heat pumps’ manufacture, we can only provide you with an idea of the operating CO2 production and savings of heat pumps compared to other heating methods on the market. As the working fluid (HFC [Hydrofluorocarbon] refrigerant) contained within the heat pump has the potential to damage the environment, more so than that of CO2 itself, this needs to be disposed of or recycled correctly according to law. HFC refrigerant is in itself is ‘ozone-friendly’ and gone are the days where harmful CFC gasses [Chloroflurocarbon] were used in fridges, air conditioners and aerosol’s around the globe. The below chart gives a basic representation of how damaging these gasses are to our environment compared to CO2. 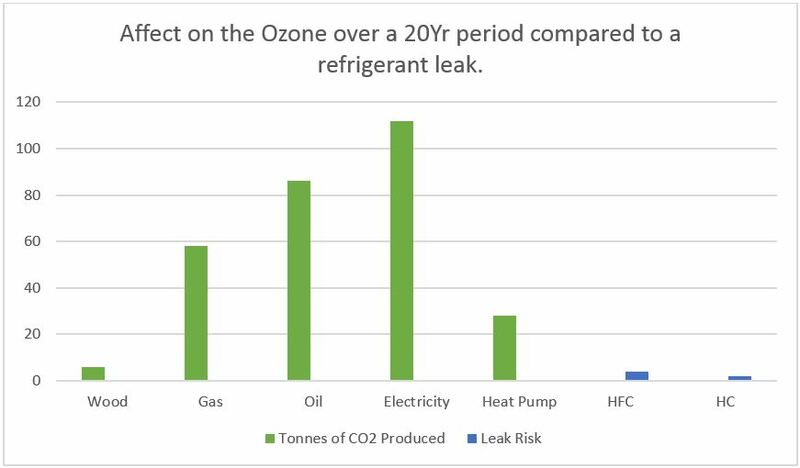 Even though the HFC heat pump refrigerant gas is very unlikely to leak from the unit, we have however, in the graph below, provided a visual representation of the damage it will cause to the environment. We have presumed that 2Kg of this gas has leaked out of a heat pump over the 20 Year lifespan of the unit, and compared this to other different space heating methods available and their lifetime CO2 production. Figures taken from a home that uses 3,900kWh hot water and 11,000kWh space heating with general assumptions made on the efficiencies of each technology. Like all renewable energy space heating technology, it is advisable to mitigate against heat loss from the property in which it is installed, by insulating it as far as is practicable. This greatly assists the efficiency of the overall solution and decreases the amount of time the heat pump will be required to be operational, therefore saving you money on the operating costs. How much CO2 is saved by using a heat pump? As heat pumps require electricity to operate, the higher the COP (coefficient of performance) of your heat pump, the more energy you will extract from the air or ground per unit of electricity used to operate the pump. 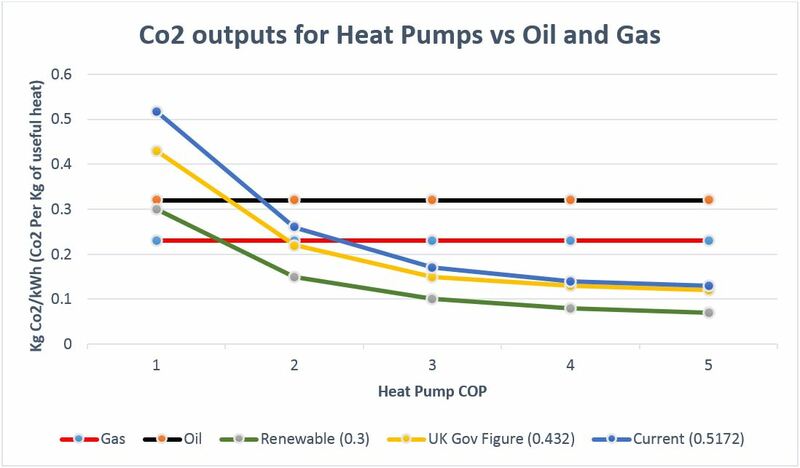 As the national grid electricity slowly attains a lower carbon approach, the chart below gives you a visual representation of the CO2 benefits of running a heat pump compared to Oil or natural gas space heating methods. The blue, yellow and green lines indicate the level of pollution variance between the national grid generation methods (nuclear, coal etc). The green line indicates that of a future grid powered predominantly by renewable methods. For those who combine a Heat Pump with Solar Panel or Wind Turbine generated electricity the outputs will be similar (if not marginally less because national grid electricity will still be used to power the device when there is either no wind or sun). Given current figures of 0.5, it is necessary to have a COP of about 1.72 to equal the pollution caused by oil heating. The UK figure for CO2 pollution caused by electricity generation has been 0.422 (kg CO2/kWh). The actual current figure is around 0.5, and will be higher during winter months when coal power station are operational in order to meet increased energy demand, and lower at night when nuclear generation covers demand. It is also advisable to note that unlike other more conspicuous renewable energy technologies, heat pumps have little impact upon the surrounding area. One potential issue, however, is the case of air source heat pump noise. It is for this reason that obtaining planning permission may be necessary (more on this here). The level of noise emitted by systems varies dramatically however, so it is necessary to check with manufacturers.